Are most 3D teeth model styles designed to be life-size and accurate? Although many of the anatomical models of the human body are designed to be absolutely lifelike in every aspect (including size), the 3D teeth model is not. 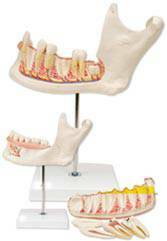 The model itself is highly accurate in its depiction of the conditions of the teeth and gums; however, in order to allow easy identification of issues, it is not made to be life-sized. Trying to use a human tooth in a life-size representation would be impossible for ease of structural identification. Instead, these models are designed to be oversized, allowing clear depiction of even the very small structures and conditions of the teeth. In addition, the anatomy model does not show all of the teeth. Instead, it shows two premolars and two molars that are representative of all the other teeth in the mouth. With just four teeth on the model it is not too overwhelming or confusing for the patient to follow along. The dentist or oral surgeon can provide information and point to the respective structures as they talk to the patient. This helps the patient follow the discussion on the model as well as helps them to clarify with questions any concerns they may have with treatment or ongoing prevention and oral care. Can I use a 3D teeth model with a younger patient? Younger patients will respond very positively to the use of a 3D teeth model. With younger children through teens that may not have any dental problems the model can also be a great way to emphasize the importance of routine dental care and regular dental check-ups. Since the 3D teeth model will also show common conditions such as gingivitis and periodontal disease it is really a great asset to any examination room. The more information that is provided to younger patients the more knowledge they will have to make important decisions about long term dental health. In addition for patients with risk factors for different types of dental conditions and disease early education and preventative dental hygiene programs are a must. What are the common conditions shown on a 3D teeth model? Good quality 3D teeth model styles will show a variety of different dental health problems. These can include the common issues of gingivitis and the more advanced stages of periodontal disease. In addition the model should also represent bone loss that leads to loose teeth, early tooth loss and pain in the gums and teeth. Additional conditions depicted on the model can include common issues such as cavities, porcelain crown replacements, posts in the teeth, fillings and inflammation in the gums and teeth. The model is fully supported by an information card that identifies the various features shown on the model. This educational card is perfect for patients that want to look at the model before or after their dental check-up or appointment. Having these models available that show the common pathologies of the teeth are ideal for starting conversations and increasing patient awareness.